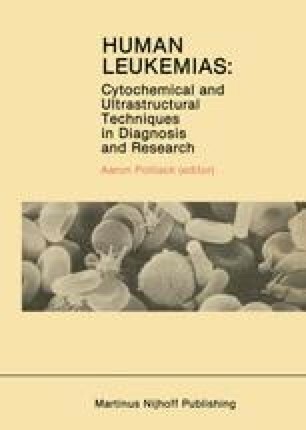 The classification of the lymphoblastic leukemias has undergone change in recent years. The two most widely accepted classifications are the United Nations’ World Health Organization (WHO) classification  and the French-American-British (FAB) classification based on Wright-Giemsa stained preparations of bone marrow smears [2, 3]. The FAB classification will be used throughout this chapter. This classification divides the lymphoblastic leukemias into L1, L2, and L3 groups. The relationship between the WHO classification and the FAB classification are shown in figure 11–1. The L2 group is most commonly observed in children and is characterized by predominately small cells with inconspicuous nucleoli and a scant amount of cytoplasm. The L2 group, most commonly seen in adults, demonstrates large heterogeneous cells, with one or more prominent nucleoli and variable, often moderately abundant, cytoplasm.